Add the baking soda to the curd and let it bubble. Mix the oil, salt and the powdered sugar till well combined. Add the egg yolks and vanilla essence and beat well. Add the a tbsp of flour to this mixture and beat well. Then add a tbsp of the curd and baking soda and mix well. Keep alternately adding the flour and curd mixture until the cake batter is well combined. Whip the egg whites till stiff and gently fold in the egg whites to the cake batter. 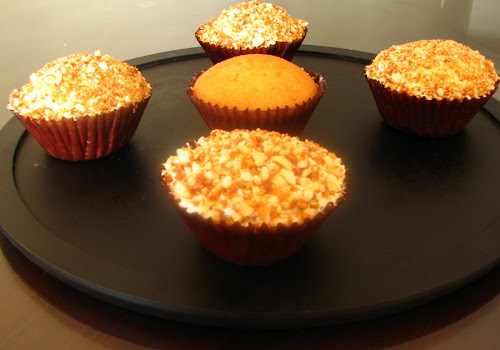 Place the cupcake liners in the baking tray and fill them 3/4 full with cake batter. 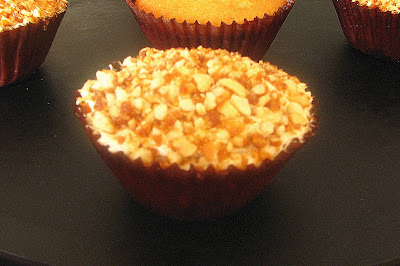 Bake for 20 min or till a toothpick inserted in the centre of the cupcakes comes out clean. Mix together milk and flour well in a saucepan and place over medium heat stirring continuously till it thickens. Add the vanilla essence and cool the mixture completely. In the meantime, beat butter and sugar till well combined and fluffy. Add the cooled milk and flour mixture and whip well for about 45 seconds. Spread the frosting over the cupcakes. Enjoy the cupcakes with just the frosting or else, dip the frosted cupcakes into any interesting topping such as colourful sprinkles, crushed peanut candy, chocolate shavings, Cadbury gems (why not? ), etc. Hope you enjoy making your cupcake as much as I do!!! @Liz: lol.. how true... I never realized these habits of mine can be traced down to genetics :) And yeah, I can definitely take some cake decorating tips from you. So do pass on the url of your blog. Is there a substitute for egg ? @Vidya: There should be and it will definitely be available where you live. Tried this this weekend. It came out perfect. Thanks for the detailed instructions. I was running to my laptop for each instruction while doing :). Keep posting. That's awesome Archana... glad that u liked it. Hey Ammu :p I tried this frosting recipe and I must tell you that this is the best cake frosting I ever ate in my life. Thank you so much!!! !